I saw the most amazing thing a few hours ago. I was driving, and suddenly I noticed a weird glow in the sky. 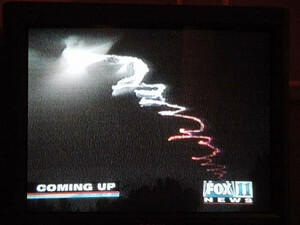 It was like a squiggly jet vapor trail, only broader and glowing and multicolored. The sun had set long enough before that the sky was completely dark, so I figured whatever this was had to be pretty high up to still be able to catch the sun. I had never seen anything like it; I guessed it might be a trail left by some kind of sounding rocket. I was pretty excited, and a little freaked out. I just don't often see large scale phenomena that I have to struggle to explain. 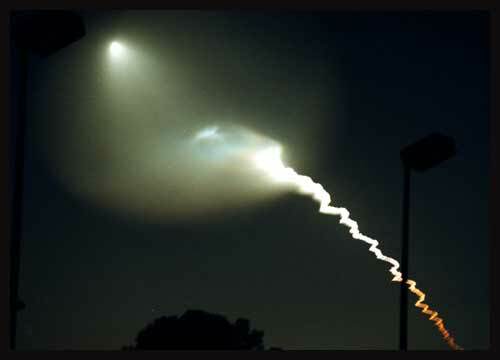 There was a guy on the street looking at it, talking on a cell phone and when I stopped and asked if he knew what it was, he said his friend on the phone told him a rocket went totally out of control while it was reentering the stratosphere and had to be destroyed. The real story isn't quite that immediately dramatic--it was a night launch of a Minuteman III ICBM from Vandenberg Air Force Base, about 150 miles away. Just a routine test. If I had been looking up at just the right time, I would have been able to see the missile moving through the sky punctuated by a weird sort of blooming as the different stages fired. This one missile was so impressive, it wasn't until a few hours later that I started to think about kilotons and overpressures and Circular Errors Probable, and the intended purpose of these missiles, and what it would be like to look up and see dozens of these crazy squiggly multicolored pulsing ribbons extending into the night sky in the first few minutes of a large scale nuclear exchange, and not know what it was for sure, but have a pretty good hunch. I used to think about that sort of stuff a lot in the 80s. I think lots of kids did. This guy had his camera handy. And here's the AP story. Those are excellent pictures. I'd be a little freaked out by that too -- it's just not something you expect to see while walking down the street at night. Does this form part of your "Welcome to L.A." story set? I kind of lucked out and had my binoculars in the trunk of my car. I thought that looked really amazing until I saw video of the missile going through the sky on the news that night; now *that* was amazing. Two words -- RED DAWN! dude I SAW TH@ TOOOOO!